WHILE HUSSEIN Obama and his gang of accomplices opine about the “plight” of the so-called “refugees”, ushering them into America’s bosom to the detriment of national security, the silence re the continuous slaughter of Christians is beyond deafening. Eerily so. ALONG with said anti-Christian perspective, is it surprising that the following new stats reflect said hatred? As the administration pushes ahead with a “surge” of Syrian refugee processing aimed at reaching its target of 10,000 this fiscal year, the proportion of Christians among those admitted remains smaller than one percent of the total. Since the Paris attack last November highlighted the risk of terrorist groups using refugee admission programs as a cover to gain entry into Western countries, the State Department has now admitted 1,075 Syrian refugees. Of these 1,075 Syrian refugees, 1,070 are Muslims, 4 are Christians and 1 is described as “no religion.” Of the 1,070 Muslim refugees, 1,044 are Sunni Muslims, 8 are Shi’a Muslims and 18 are otherwise undefined Muslims. The 4 Christian refugees make up 0.37 percent of the total. The 1,044 Sunnis make up 97.1 percent. State Department Refugee Processing Center data for the fiscal year to date show that a total of 1,366 Syrian refugees have been admitted since October 1, 2015. With the fiscal year more than half over, the administration has thus far managed to reach less than 15 percent of the target of 10,000 Syrian refugees announced by President Obama last fall. The State Department recently established a special “resettlement surge center” in Amman, Jordan, aimed at speeding up processing times dramatically. The department maintains that the fast-tracking will not compromise security screening. At the time when the Syrian conflict began in early 2011 – after the Assad regime cracked down on initially peaceful protests – Christians made up an estimated 10 percent of the Syrian population, and Sunnis an estimated 74 percent. Yet that proportion is nowhere near reflected in the total number of refugees admitted to the U.S. since the conflict began in March 2011. Since then, a total of 3,239 Syrian refugees have entered the U.S., of whom 3,049 (94.1 percent) are Sunnis and 57 (1.7 percent) are Christians. IN tandem, not content with slaughtering Christians, militant Islamic jihadists “religiously” burn their houses of worship to the ground. Ashes. Again, deadly silence from HUSSEIN Obama. Has the western world gone mad? Not really, if past is prologue. ON the one hand, it must be recognized that nothing of substance has been learned since the Holocaust. Basically, the pretense is that (pithy) monuments and speeches made by (some) western leaders – all the while blaming Jews for not giving in to those seeking to annihilate them, once again – demonstrates their commitment to tackling highly resurgent anti-semitism. Liars. Reprobates. SO if one realizes that it took the slaughter of six million Jews for the leadership of the free world to even begin to intervene, what does that say about those who are designated as leaders of the west, regardless of this or that election? Moreover, what about yesteryear’s European leadership (actual collaborators to the Holocaust), have their replacements learned any lessons at all? Does deaf, dumb and blind pass for government policy, such that it is? IN this regard, bear in mind that HUSSEIN Obama is “in sympathy” with militant Islamic jihad, resultant, the slaughter of tens of thousands of Christians – even millions, let alone his unbridled hatred toward Jews – is little more than gum under his shoes. TO wit, is anyone shocked that the deviants occupying the People’s House are living large and partying hearty, all the while Christian blood is flowing non-stop (never mind the intra-Muslim warfare, as they jockey for hegemony) with their houses of worship decimated alike? This “major impact” is not limited to Nigeria. Saudi Arabia annually spends over $100 billion disseminating “Wahhabi and Salafist teaching”—or what growing numbers of Muslims refer to as “true Islam”—including through European and American mosques. Behind the radicalization of ISIS, Boko Haram, and Lone Wolf jihadis stand America’s best Muslim friends and allies. The report finally finds that much of the anti-Christian violence derives from the historical “migration of Muslims into non-Muslim territories in northern Nigeria to promote the Islamic religious and missionary agenda in all parts of northern Nigeria.” In other words, what Christians in Nigeria are experiencing is a live snapshot of what millions of Christians and other non-Muslims have experienced since the seventh century, when Islam “migrated” to their borders: violence, persecution, enslavement, and the destruction of churches….continue reading…. STILL yet, it goes without saying that there is nothing that HUSSEIN Obama wouldn’t do, or task his goons to perform, when the above is fully internalized – and it is barely the tip of their crimes against humanity! AND so it was an easy leap to invent a “reason” to perform a full-on RAID of the home of a citizen journalist, whose sole “crime” was exposing the ILLEGAL and INHUMANE practices of the abortion industry, “courtesy” of Planned Parenthood! Daleiden has been under attack by pro-abortion groups since his Center for Medical Progress videos were released last year, revealing Planned Parenthood affiliates trafficking in the sale of baby body parts to medical researchers under encouragement from Planned Parenthood’s senior medical director. 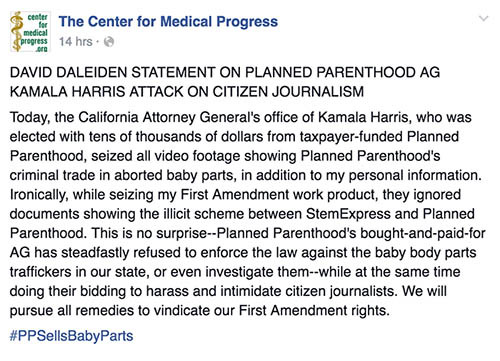 The seizure of Daleiden’s materials, including a laptop and several hard drives, happened under the direction of California state Attorney General Kamala Harris (D), who is currently running for Senate and has received campaign funds from Planned Parenthood. The raid happened hours after the Center for Medical Progress released its most recent video, which exposes the fraudulent consent form Planned Parenthood affiliates used to acquire the bodies of aborted babies. The form, which was written and authorized by Planned Parenthood Federation of America and provided to its affiliates, tells pregnant women considering abortion that aborted fetal tissue “has been used to treat and find a cure for such diseases as diabetes, Parkinson’s disease, Alzheimer’s disease, cancer and AIDS.” No cures for these diseases are currently available, and no current therapies for them use aborted fetal tissue. Consent is considered legally invalid if misrepresentation (like Planned Parenthood’s) is involved. DEAR readers, fellow patriots alike, is “Obama’s Amerika” more akin to a fascist nation, or not? If not, why not?? REST assured, history has a way of peeling back the filthy lies manufactured by this and that leadership, regardless of the passage of time. Their accomplices alike. Even so, it doesn’t bring back the tortured souls who were lost due to their willful immoral blindness or any other assistance given, be it overt, covert or through “mere” winks and nods. This entry was posted in Uncategorized and tagged 000 Christians and Destruction of 13, 000 Churches in Nigeria, following new stats re Islamic "refugees", Islam Exposed, Muslim Slaughter of Over 10, Obama's "Justice" goons RAIDED home of a citizen journalist, silent bystanders, The Homeland Security Network, Watcher's of Weasels Award Nomination by Adina Kutnicki. Bookmark the permalink.